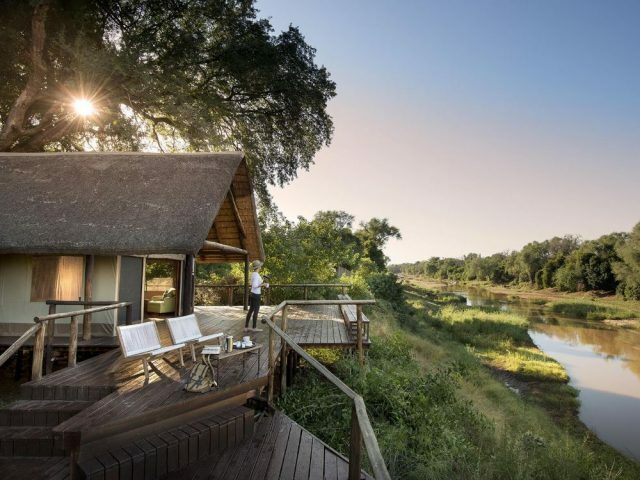 Breathtaking views from the main deck and lounge area over the river, complete with pods of snorting hippos, and the new waterhole – grab yourself a cold beer and settle down in a lounger and you’ll feel the tranquillity of the bush start to seep into your bones! 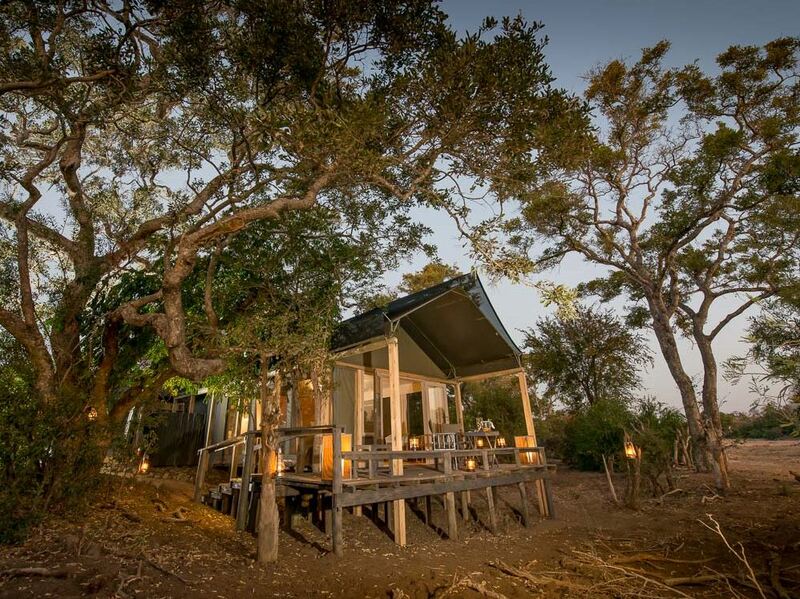 Go to sleep at night in your comfortable and newly stylish tent to the wonderful sounds of the bush at night – perhaps jackals yelping or lions roaring (or even just frogs croaking!) – there’s something about sleeping under canvas that just adds to the whole experience! Just 11 rooms in total, so it’s a really intimate and personal experience. Great for families too! New Spa means you can enjoy even more personal spoiling! when the Bushscapes team stayed here on a recent trip (during which they visited over 20 different lodges) Simbavati emerged as their favourite lodge of all - and bear in mind that some of the other lodges they saw were far more luxurious and expensive! The first thing that strikes you after arriving at Simbavati River Lodge is the stunning view out over the river from the lodge’s main viewing deck – you can already picture yourself spending many happy hours relaxing here with a cold drink, good book and perhaps a pair of binoculars to keep a closer eye on the hippos in the pool as well as other animals coming down to drink. The second, and even more long lasting impression, is of the wonderfully warm air of hospitality that is exuded by all of the lodge’s staff – quite simply there is a fantastic “vibe” about Simbavati that makes you instantly feel at home and promises a truly memorable stay! Whilst a recent revamp has meant that it's not out of place in the pages of a coffee-table décor magazines, Simbavati is the perfect example of a lodge which is rather more than the sum of its individual parts – so much so that when the Bushscapes team stayed here on a recent trip (during which time they visited over 20 different lodges) Simbavati emerged as their favourite lodge of all - and bear in mind that some of the other lodges they saw were far more luxurious and expensive! “So what was so special about Simbavati?” I hear you ask. Well first up must be the lodge’s stunning setting, nestled on the banks of the Nhlaralumi River where the rooms are shaded by age old Jackalberry and Leadwood trees. The lodge’s main deck boasts breathtaking views of the river with a newly built waterhole tucked right under your nose providing close-up game viewing opportunities - it's the perfect place to chill on a comfortable couch with a book or doze off on an afternoon siesta with the hippos serenading you off to dream-land with their snorting! Perhaps the one pity is that the lodge’s swimming pool is not right there on the deck as is the case with so many camps – then again it probably makes for a more tranquil and relaxed environment on the view deck, especially for those guests who just want to sit quietly and watch the animals. 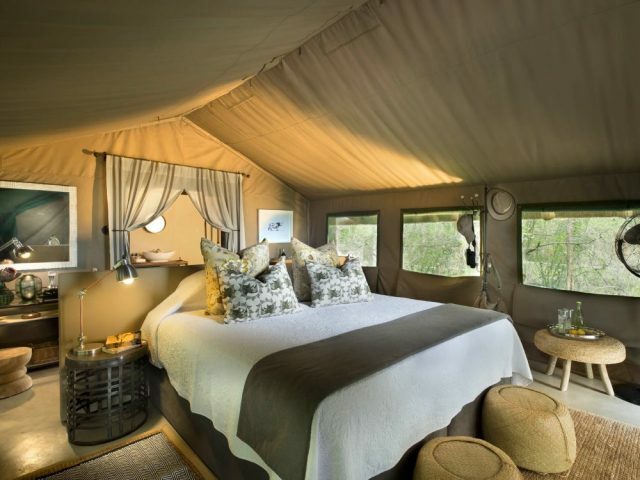 The accommodation at Simbavati consists of just eight luxury safari tents and three chalets, so the camp is really intimate and personal. Our pick of the rooms funnily enough are actually the tents, as we feel that they have more style and character than the chalets whilst also boasting the necessary comforts like air-conditioning and modern en-suite bathrooms. In our experience there’s also an unmistakeable sense of adventure and of genuinely being out in the wilderness that comes from sleeping under canvas as opposed to being tucked away in a more insulating (or perhaps isolating is a better term) conventional room – in a tent you can really hear all of the night sounds of whooping hyenas or perhaps roaring lions through the canvas! 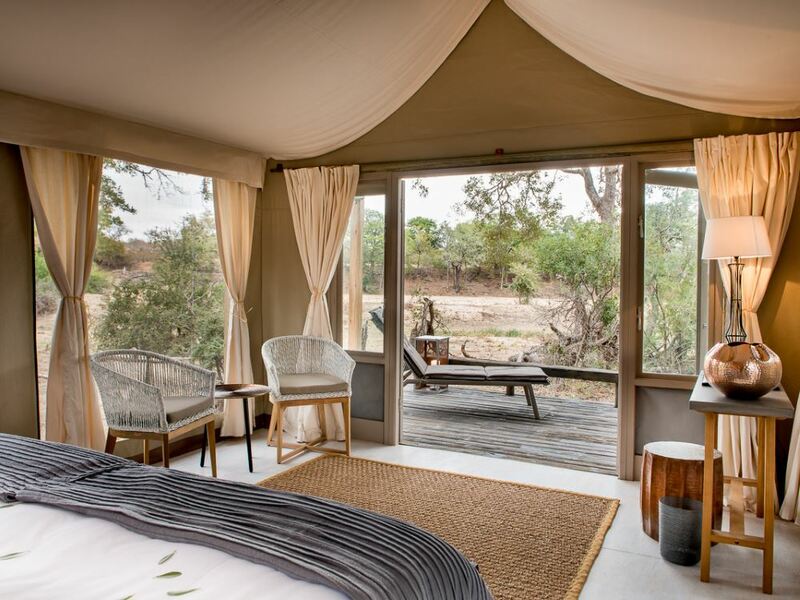 Tents are spaced adequately far apart to ensure privacy and offer generous bush or water views from your own private viewing deck. They have all of the amenities to ensure a comfortable stay with lovely comfortable beds and quality linen, the welcome cooling of air conditioning in summer (and heating for those chilly winter months!) as well as a romantic inside shower and outside bath. Simbavati also has three family chalets available, each with two separate bedrooms sharing one bathroom. The interiors are very simple but comfortable and boast very much the same features as the tents but under thatch. Parents will no doubt be delighted that the kids are kept occupied by a junior ranger's programme to increase their wildlife knowledge and there is also a large selection of interesting books which are at their disposal too, so Simbavati certainly ticks the “family-friendly” box! Simbavati takes its name from the local Shangaan language, translated as “the place where the lions come down from the stars” - and if you’re keen to see lions then you’ve certainly come to the right place! The Timbavati is famous for its big cats and perhaps you may even be lucky enough to spot one of the reserve’s fabled and unique white lions (two white lions have been born in recent years into resident prides, giving you a great chance of seeing these cubs while visiting Simbavati) Having said that, lions certainly aren’t the only cats you’re likely to see, with the Bushscapes team having a fantastic leopard sighting (which is happily pretty commonplace at Simbavati!) There are no fences between the Timbavati and Kruger allowing free movement of wildlife between the two reserves - you traverse over 12 000 hectares of prime Big Five game country, with game such as elephant, rhino and huge herds of buffalo common. 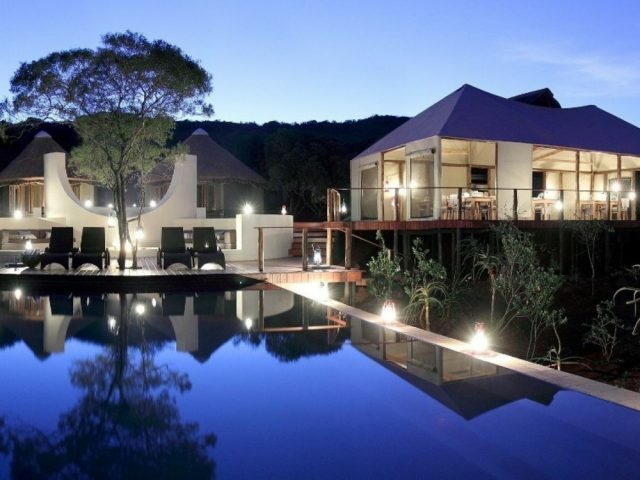 The lodge offers the usual game drives in the early morning and evening when the game is at its most active. We found the guiding at Simbavati excellent and great fun too – be prepared to be astonished by the legendary bush-craft and tracking skills of your Shangaan tracker! There are excellent photographic opportunities – in fact the lodge even has a specially adapted game vehicle kitted out for serious wildlife photography enthusiasts – and our ranger was an expert photographer himself and was happy to share tips and advice with us, and to manoeuvre the vehicle into the best positions to take great shots! After your game drive you’ll return to a festive dinner either served around the fire in the open-air boma or in the thatched dining area – here you have the chance to swap bush tales with fellow guests and your ranger over a cold beer (or three!) The food here at Simbavati gets consistent rave reviews from guests too. Simbavati River Lodge is an uncomplicated and down to earth safari experience where you are encouraged to relax and feel at home. We enjoyed great safari drives with the ranger and his tracker, who were knowledgeable and went out of their way to get some superb sightings – in fact the staff throughout the lodge are wonderfully warm and friendly. And the rest of the time you can enjoy Simbavati’s fantastic setting right on the river and waterhole - with its inviting open plan lounge area and viewing deck, you can relax and let the game come to you! Families with younger children can arrange a private vehicle prior to arrival.